AMT, which stands for Aluminum Model Toys was founded in 1948 by attorney West Gallogly, in Michigan. In the early postwar period, new cars were diﬃcult to get and did not remain in stock for long. The concept of “promotional models” provided a miniature, three-dimensional representation of the actual car, something potential buyers could see and touch when standing in an empty showroom. Postwar aluminum was inexpensive to obtain and Gallogly’s connections with Ford resulted in a replica of the 1948 Ford Tudor Sedan being produced as a promotional model. Cast in 1/25 scale and painted in stock Ford colors, it was oﬀered to Ford’s dealers, becoming a valuable sales tool. Ironically, AMT’s first aluminum product would be its last. During the company’s infancy, early AMT employee George Toteﬀ devised the “sliding pillar” tooling design, which allowed for the production of more complex shapes (like miniature car bodies) in plastic and in one piece. The switch from aluminum to plastic allowed for faster production, eliminated costly painting, and reduced cost. The lower cost of plastic promotional models transformed them from costly dealer sales props to relatively low-cost giveaway items. AMT continued to produce promotional models and flywheel-powered toy cars well into the 1950s. In 1953 they released three “triple kits” each featuring 3 unassembled promotional models. In 1956, Erik Erikson established SMP (Scale Model Products) as a subsidiary of his own Detroit Plastic Products, but with considerable financial interest held by AMT. SMP was established to “get a foot in the door” with Chevrolet, which may have been holding back from dealing with AMT due to the latter’s close ties with Ford. SMP would produce Chevrolet and some Chrysler promotional models, while AMT continued its production of Ford and GM (other than Chevrolet) promos. While there were other companies also making toy model cars and banks, AMT and SMP are recognized as premier original manufacturers of promotional models, whether in metal or plastic. In 1957, AMT began thinking about ways to expand the market for their products, witnessing the rising interest older kids were having, customizing their promotional models and flywheel-powered AMT toy cars. Once their 1958 promotional model runs were completed, AMT added several customizing parts to the tooling, produced the models in styrene, and introduced the now famous 3-in-1 Customizing Kit series. Response was phenomenal and by 1961, AMT needed their own production facility. A building was constructed on Maple Road in Troy, Michigan to house all operations, from design, to pattern-making, to production. The 1960s were amazing times for AMT. From 1959 to 1964 AMT had a marketing guru by the name of Budd “The Kat” Anderson. He’d travel the country, attending car shows and model contests, creating excitement over AMT’s products. Countless young modelers simply could not get enough and the kits were selling in the hundreds of thousands! Legend has it that in 1961, during a lunch break from a model contest being held at a custom car show in Birmingham, Michigan, Budd was walking down the street with the son-in-law of AMT’s owner. A group of boys competing in the contest were passing by, when one of them pointed out Anderson and said, “Hey, there’s the cat from AMT!” Budd and his cohort continued to chat about the occurrence upon their return to AMT’s oﬃces and the rest is history. The name stuck! To add some flair, they tweaked the name to be spelled as “Kat”. 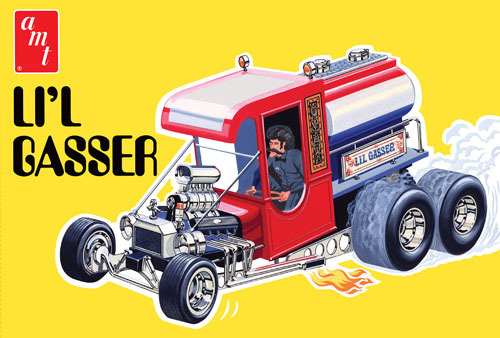 This was in line with the ‘K’ for Kustom being used in conjunction with George Barris’ involvement in many AMT kits. From that point on, Budd was known as the Kat from AMT and became the first true celebrity of car modelling. Not long after, the Kat caricature was sketched up by an art department creative and the marketing package was complete. AMT used the name and character extensively on their kits and in Budd’s regular columns appearing in model car magazines of the early 1960s. In addition to Barris, AMT worked with other famous names in car customizing such as Gene Winfield, The Alexander Brothers and Dean Jeﬀries. The result was countless “Annual” 3-in-1 and “Trophy Series” kits featuring specialized stylizing and performance parts to build stock, custom or racing versions. 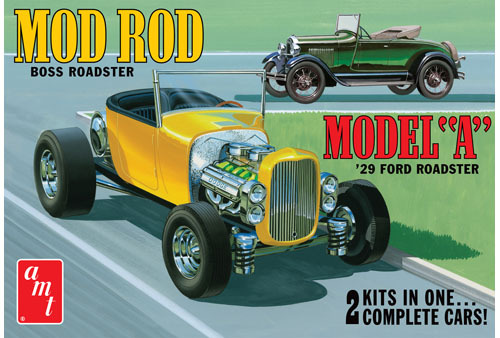 Replicas of famous 1:1 show rods and customs like the Ala Kart, Fireball 500 and Deora were all kitted in 1/25 scale, featuring all the latest speed parts of the era. Everybody wanted their products produced in scale by AMT! But scale models weren’t the only projects! The growing success of licensed kits and the use of customized vehicles in TV and movies lead AMT to establish its Speed & Custom Division in 1965. 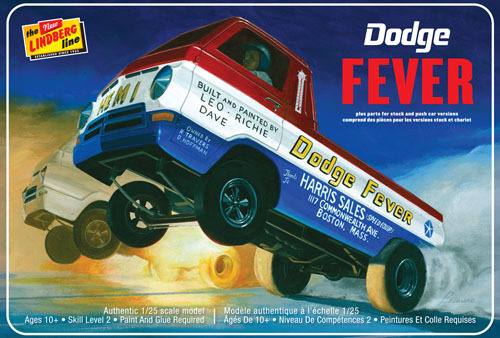 Based in Phoenix, Arizona and with famous customizer Gene Winfield at the wheel (and other associates like Sam Foose in house) the goal was to produce 1:1 custom vehicles for the film and TV industry. In association with the Marbon Chemicals Company, AMT developed the idea of turning Marbon’s plastic-bodied CRV (Cycolac Research Vehicle) into a “real” full sized kit known as the Piranha that consumers could buy and assemble. A custom Piranha Spy Car was built for the Man from U.N.C.L.E. TV series and a roadster-styled Piranha body was used to create the Piranha dragster, campaigned by AMT to promote the project. AMT wasn’t just about cars though: in 1966 the company’s construction of on-camera models for a then-new TV series called Star Trek lead to an agreement for AMT to produce model kits based around the show. The license has proven to be probably the biggest and longest-lasting in model kit history, with respect to TV and movies. Related Star Trek kits are still being developed and produced by AMT to this day. Throughout the remaining 1960s and into the 1970s, AMT continued to produce some of the most memorable plastic model kits of all time. Of course, there were cars of all types. 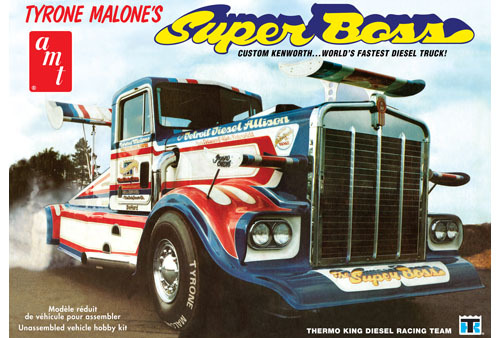 But big rig trucks, aircraft, fictional subjects and other spacecraft were all represented in the yearly kit catalogs. Monsters, rockets and even replicas of the Flintstones, not to mention a few of Leonardo Da Vici’s inventions, made appearances too! The company’s production stayed in Troy until 1979 when they were bought by Lesney’s Matchbox Toys division. At this point, production was moved to Baltimore, Maryland and remained there until 1996, despite AMT being bought again by another company in 1982. In March of that year, the AMT line and its tooling were sold to The Ertl Company of Dyersville, Iowa. A couple years later, MPC was added to the mix as another acquisition by Ertl. However, Ertl themselves were bought up by Racing Champions in 1999. Despite RC’s primary focus of acquiring Ertl’s die cast tooling lines, production of plastic kits continued; but the output left something to be desired. The decision was made to sell oﬀ the model kit brands and the company began entertaining oﬀers. With RC2 (now Learning Curve’s) intentions known, Round 2 founder Thomas Lowe entered into an exclusive 1 agreement to license the AMT property (including MPC). The license would allow Round 2 to explore whether or not AMT could again be made successful. 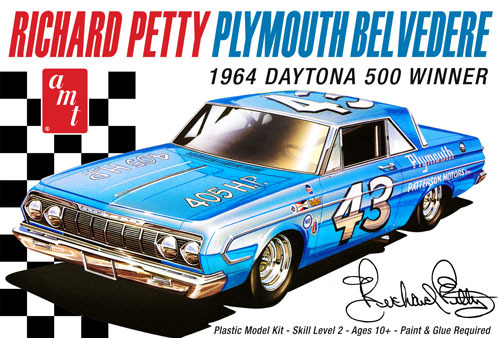 With AMT in the hands of “model car guys” and the MPC brand resurrected, it wasn’t long before many wonderful and historic model kits were being produced again. Modelers became excited and support for the products quickly grew. In 2012 the tooling and brands were purchased outright by Round 2, making South Bend, Indiana the new home for AMT! 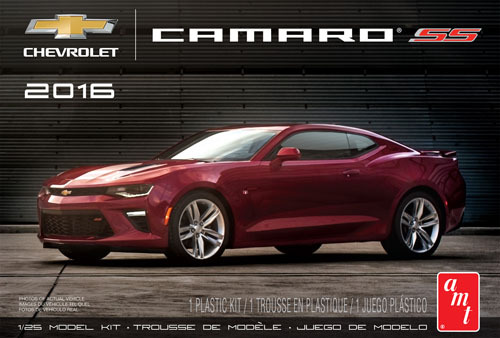 Since then, several all new kits, based on modern muscle cars have been released in AMT’s “Showroom Replicas” series. These kits harken back to the days of the aforementioned promotional models and really show how the brand has come full circle. Additional landmark licensed kits of the 1966 Batmobile and a wonderfully gigantic 1/350 Star Trek Enterprise from the original series, all created with new tooling have been released with great success as well. Round 2 has many more great things planned for AMT and the “new Kats” are very proud to be the caretakers of modeling’s most historic brand.